I just had a meeting with a director from another department in my office. Halfway through the meeting she offered to show me some data and needed a web browser to login to the system. At the time I still had the page above open in my browser so I popped open a new window, turned the screen around and let her work. After she was done, she went to close the window and all I could think of was, "Damnit, now she'll see I screw off at work looking at car sites." 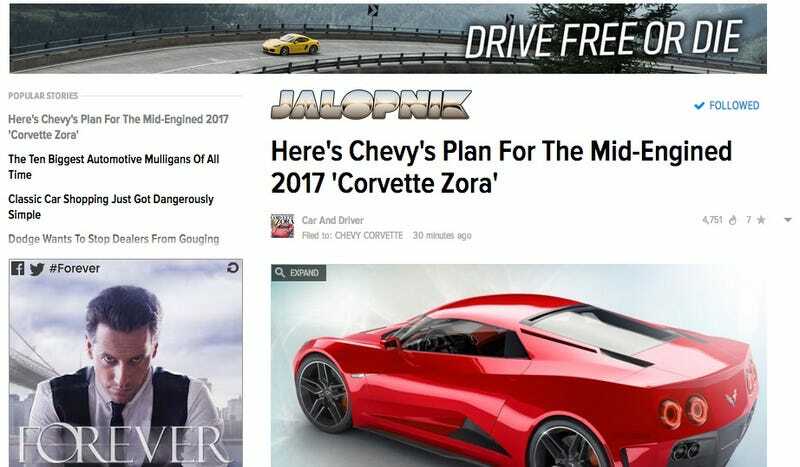 Instead she says, "Oh, Jalopnik. Always good." Then we proceed to talk Corvettes (her dad has two), F1 (we both know people on teams), and 24hrs of LeMons (she's jealous I'm racing this weekend). Sometimes it's okay that you look at car stuff at work. Made a new car friend because of it.